Offering a groundbreaking and intelligent discourse on Canada's national sport, this collection of more than 35 interviews with current and former NHL players, coaches, executives, and famous commentators explains and expounds on the enigmatic relationship hockey has long maintained with Canadians, and its relationship with national identity and culture. 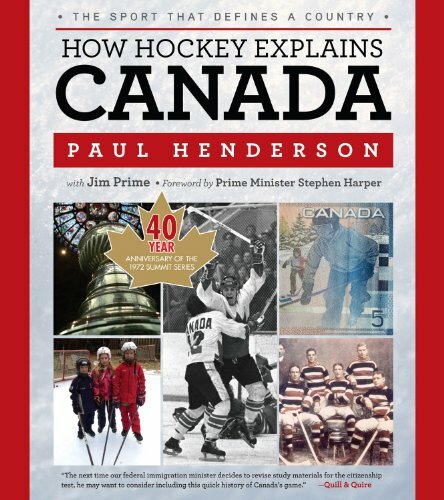 Written by celebrated hockey star Paul Henderson—known widely as the scorer of Canada’s “Greatest Goal” in 1972—with a foreword by current Prime Minister Stephen Harper, each interview and account captures the spirit of hockey and its role as a unifying force across 33 million Canadians, and includes the sport’s most-loved icons, greatest plays, notorious brawls, and the infamous poll of great Canadians in history that placed outrageous commentator Don Cherry ahead of Alexander Graham Bell. Paul Henderson played for the Detroit Red Wings, Toronto Maple Leafs, and Atlanta Flames over his 13-year professional career. He lives in Mississauga, Ontario. Jim Prime has written more than 12 sports-related books, including Tales from the Red Sox Dugout and Ted Williams: A Splendid Life. He lives in New Minas, Nova Scotia. Prime Minister Stephen Harper is the 22nd Prime Minister of Canada and a former member of Parliament. He lives in Ottawa, Ontario.